Children’s denim historically looks to women’s and men’s fashion for inspiration, but the category is increasingly mixing up with sport. Premium and boutique denim brands showcased Spring ’19 collections at The Children’s Club last week in Las Vegas that offered the best of both worlds. Boutique brand Blu & Blue’s Spring ’19 range of lightweight chambray denim is bound to resonate with busy parents seeking effortless fashion for boys and girls. The line, which spans sizes 0 to 16 years, focused on elevated basics for boys and age-appropriate fashion items for girls. Button-down shorts, jeans and chambray bomber jackets topped the boys’ collection. For girls, Blu & Blue offered gold star print jackets and ikat print rompers and dresses trimmed with bohemian pom-poms for spring. Floral embroidery decorated dresses, billowy shirts and flare jeans for older girls. A Mod-inspired patchwork denim shift dress was a standout for tweens. Many styles are available as options for toddlers and juniors, allowing big sisters and little sisters to coordinate. Lifestyle brand Hayden Girls blended traditional pieces like denim jumper dresses with on-trend leopard and sequin dresses. The brand’s short sleeve jean jacket with flouncy sleeves and hem hit the mark for sophisticated tweens. DL 1961 tapped into a sun-soaked athleisure vibe for its girls’ collection. The brand’s range of jeans and denim shorts was awash in coral, light mint green and faded pink and teal. Jackets were a hybrid between a Trucker and casual hoodie. That athleisure look was found throughout kids’ premium denim collections—especially for boys. AG Jeans focused on pull-on skinny jeans with faux buttons and novelty waistbands for boys. Dark wash French terry knit separates worked on their own or as a set for Joe’s Jeans. Sport influenced girls’ denim, too. Taping on the side of jeans and denim shorts—be it a contrasting color or with text—were prominent across collections. Jeans that mimicked the look of tearaway track pants with buttons or snaps on half of the pant leg was a new look on the scene. Coordinating denim jackets and bottoms were trending at the show for both kids and women. 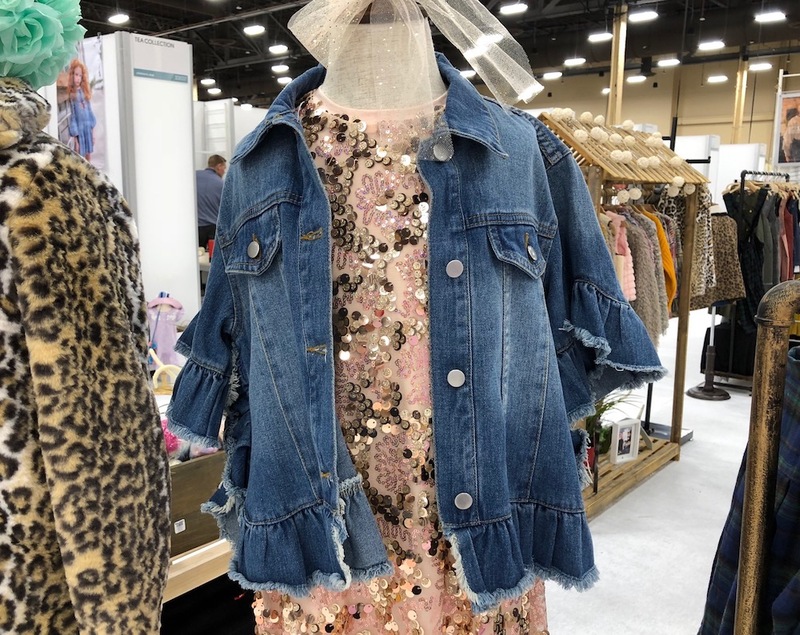 A girls’ bright pink denim jacket and shorts with red fringe made an impactful impression at the Joe’s booth, but a rep for the brand said retailers weren’t necessarily buying both pieces. Most buyers, she said, are picking up one of the statement pieces to merchandise with the brand’s more classic styles. In terms of fashion, the focus remains on the ankle. Deep single cuffs, “dog bite” hems, released hems and frayed hems are among the must-have styles by AG, Hudson and Joe’s. However, side lacing is picking up momentum as girls look to women’s wear for inspiration. Sparkle is always in style for girls, but this season’s crystal embellishments, sparkly waistbands and flap back pockets hint to influences from the late ’90s and early-aughts. Meanwhile, floral embroidery on white denim, jeans with crochet trim and shorts with classic cuffs captured a timeless summer feel.